In the United States, probability-based water quality surveys are typically used to meet the requirements of Section 305(b) of the Clean Water Act. The survey design allows an inference to be generated concerning regional stream condition, but it cannot be used to identify water quality impaired stream segments. Therefore, a rapid and cost-efficient method is needed to locate potentially impaired stream segments throughout large areas. We fit a set of geostatistical models to 312 samples of dissolved organic carbon (DOC) collected in 1996 for the Maryland Biological Stream Survey using coarse-scale watershed characteristics. The models were developed using two distance measures, straight-line distance (SLD) and weighted asymmetric hydrologic distance (WAHD). We used the Corrected Spatial Akaike Information Criterion and the mean square prediction error to compare models. The SLD models predicted more variability in DOC than models based on WAHD for every autocovariance model except the spherical model. The SLD model based on the Mariah autocovariance model showed the best fit (r2 = 0.72). DOC demonstrated a positive relationship with the watershed attributes percent water, percent wetlands, and mean minimum temperature, but was negatively correlated to percent felsic rock type. We used universal kriging to generate predictions and prediction variances for 3083 stream segments throughout Maryland. The model predicted that 90.2% of stream kilometers had DOC values less than 5 mg/l, 6.7% were between 5 and 8 mg/l, and 3.1% of streams produced values greater than 8 mg/l. The geostatistical model generated more accurate DOC predictions than previous models, but did not fit the data equally well throughout the state. Consequently, it may be necessary to develop more than one geostatistical model to predict stream DOC throughout Maryland. Our methodology is an improvement over previous methods because additional field sampling is not necessary, inferences about regional stream condition can be made, and it can be used to locate potentially impaired stream segments. Further, the model results can be displayed visually, which allows results to be presented to a wide variety of audiences easily. Earth System Science Center (ESSC): 1998, Soil Information for Environmental Modeling and Ecosystem Management, ESSC, Pennsylvania State University, Web page, Accessed November 5, 2004, http://www.essc.psu.edu/soil_info/index.cgi?soil_data&index.html. Multi-Resolution Land Characteristics Consortium (MRLC): 2003, ‘U.S. Federal Region III land cover data set’, Web page, Accessed June 17, 2005, http://www.epa.gov/mrlc/. 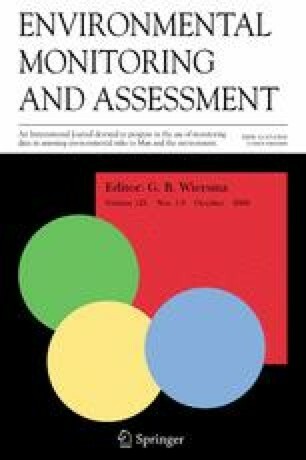 U.S. Environmental Protection Agency (USEPA): 2005, Level III Ecoregions, Web page, Accessed August 13, 2003, http://www.epa.gov/wed/pages/ecoregions/level_iii.htm. U.S. Geological Survey (USGS): 2003, National Elevation Dataset, Web page, Accessed January 4, 2005, Available at http://ned.usgs.gov/. U.S. Geological Survey (USGS): 2004, National Hydrography Dataset, Web page, Accessed January 27, 2005, Available at http://nhd.usgs.gov/.